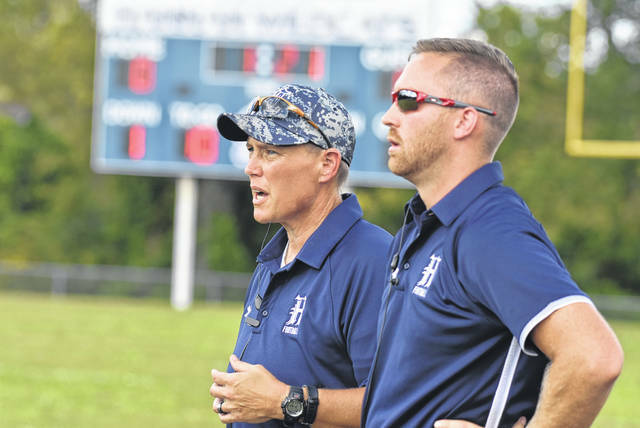 Hannan football coach Kellie Thomas, left, discusses a play with a member of her staff during a Sept. 15 contest against Hundred at the Craigo Athletic Sports Complex in Ashton, W.Va. If Hillbillies are known for their missing teeth, then Man might feel a little better in the morning. The Point Pleasant football team remained unbeaten after handing host Man a 49-0 thumping on Friday night in Logan County. The visiting Big Blacks (7-0) built leads of 14-0, 21-0 and 49-0 through each of the first three periods, then simply let the clock run out en route to securing the program’s second shutout of the fall. Cason Payne ran for three scores and threw for two more, while Brady Adkins and Josh Wamsley each added a rushing and receiving touchdown for the Big Blacks — who completed their road schedule with the triumph. The final outcome of the Buffalo at Hannan contest was not available at press time. Wahama did not play this weekend due to a Week 9 bye. The Big Blacks return to action Friday night when they host unbeaten Spring Valley for a 7:30 p.m. kickoff. Hannan will host Parkersburg Catholic next Friday in a Homecoming contest at 7 p.m.
Wahama travels to Trimble for a TVC Hocking contest on Friday night at 7:30 p.m.
Due to an early deadline, the Mason County football games from Week 9 will be available in the Tuesday sports edition of the Point Pleasant Register. The game stories will be available online at mydailyregister.com before appearing in print.